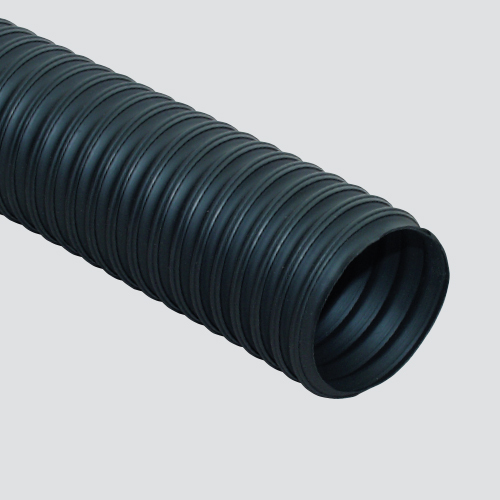 This urethane ducting hose with steel spring wire helix. The polyurethane compound provides excellent resistance to abrasion, chemicals, ozone, and weathering, while the steel spring wire helix provides crush resistance and helps the hose hold its shape during operation. A great low pressure hose for more demanding applications like lawn/leaf/dust collection, straw blowing, fertilizer broadcasting, and bulk material handling. Notes: Manufacturer testing completed at 68°F for PSI and minimum bend radius. Increase or decrease in temperature may affect hose performance.